When Trump chose to recognize Jerusalem as the capital of Israel, protests against his decision reverberated globally. UBC students and the Vancouver Palestinian diaspora marched through downtown Vancouver, bringing demonstrations closer to home. Escorted by several VPD officers and vehicles, solidarity for Palestine protesters began outside Vancouver’s American embassy and marched towards the Vancouver Art Gallery. “I think this is the ideal time for all Canadians who believe in justice and human rights to voice their opinions, to either actively boycott Israeli products that support the occupation or tell their representatives what they want them to act as in parliament,” said Sofiya Soufi, co-president of the Solidarity for Palestinian Human Rights Club at UBC. 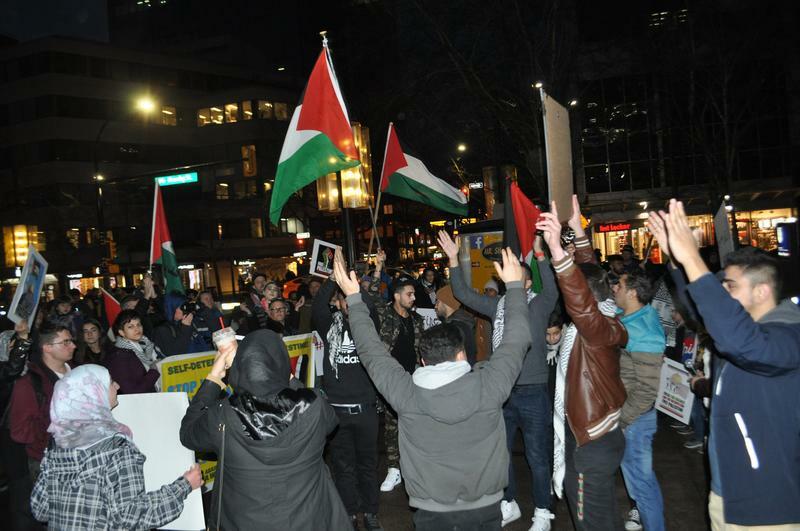 Planned by several organizations including the Canada Palestine Association and Independent Jewish Voices Vancouver, the protest not only opposed Trump’s resolution, but touched upon the Palestinian refugee crisis and the lack of political rights for Palestinians within the occupied territories. Various UBC clubs endorsed the event, with students from the Solidarity for Palestinian Human Rights Club, the UBC Social Justice Centre and The Talon in attendance. “We believe that Canada is unjustly and illegally supporting the State of Israel while Israel is in violation of international law and in violation of Canadian policy as well,” said Sara Sagair, organizer of the event. Reflected within the chants, some expressed a desire for land reprisals, while others delivered a clear-cut message, ‘Israel, Israel, you will see, Palestine will be free.’ Many speakers acknowledged the moral imperative to support Palestinians currently protesting in the occupied territories. A minor dispute took place Friday evening between Palestine protesters and supporters of Israel, and while no physical confrontation resulted, neither side wanted to comment. Saturday night witnessed the burning of the likeness of an Israeli flag. Some would argue that the burning of the Israeli flag is strictly meant to oppose the occupation, not signify any anti-Semitic sentiment. It is within this context that pro-Palestine supporters commit this act to disapprove of any annexation, while also criticizing the detainment of Palestinian children under the Israeli military prison system. The complexities and misinterpretation were evident both nights when particular chants called for an “intifada” — many people associate this expression with terrorism, and unknown to the majority, this Arabic word is meant as civil resistance amongst Palestinian people. Yet, the intrinsic value of a national home and the lack of healthy discourse has only resulted in stalemate arguments. Intimately affecting two student communities within UBC, the BDS movement which was also present at the protests, stands for Boycott, Divestment and Sanctions against companies that do business with the Israeli military or which are located within the Israeli settlements. “I can simply say that Hillel BC believes that the BDS movement as a whole is anti-semitic,” said Heller. Supporters of the BDS movement say otherwise.